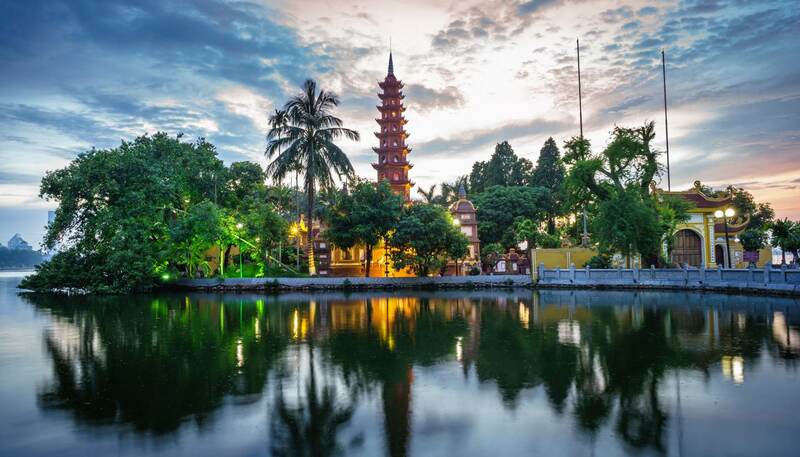 Located on the banks of the Red River with tranquil Hoan Kiem Lake at its heart, Hanoi has experienced a rapid construction boom since 1986, following the economic reform or doi moi as it’s known locally. Today, while its colonial buildings reflect the city’s past as a French Protectorate, its bustling street life is the ultimate statement of Vietnam’s can-do attitude. Spring (February-April) sees fog shroud the city in February and March, but April is pleasant with temperatures averaging 24C. Summer (May-August) is hot, humid and with frequent heavy rains. The average temperatures are between 24C to 32C. Despite the weather, this is a busy tourist season. Autumn (September-October) is the best time to visit Hanoi, particularly in October when the weather is warm with plenty of sunshine. Winter (November-January) is cold and dry. Tet, the Vietnamese New Year, takes place in January or February so many shops are closed. The public bus system is cheap but can be a challenge for non-Vietnamese speakers. Taxis and motorcycle taxis are plentiful and they are the best option for visitors to get around Hanoi, though the local government plans to ban motorbikes by 2030. For more information, see our getting around Hanoi guide. A maze of 36 narrow streets, named after the products that were traditionally sold along them many centuries ago, as well as ancient buildings (known as tunnel houses). These buildings have a very narrow frontage hiding very large rooms at the back because businesses were taxed according to the width of their storefront. Today, cafés, bars and boutique shops line the streets. This beautifully preserved temple, dating from 1070, was once an exclusive establishment dedicated to the teaching of Confucius. It later became the first university in Vietnam in 1076. The interior consists of a complex of small buildings and walled courtyards. Today it is an oasis of calm in the heart of Hanoi. Former President and the ‘father of the modern state’ Ho Chi Minh lies in a glass case here and people from all over Vietnam come to pay their respects. Security is tight and there is a strict dress code, therefore dress modestly. Nearby, the Ho Chi Minh Museum commemorates his life and depicts his struggle for the liberation of Vietnam. 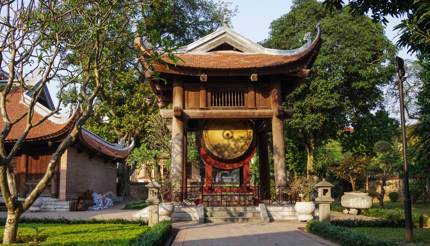 For more ideas on must-see attractions, see our Things to see in Hanoi guide. 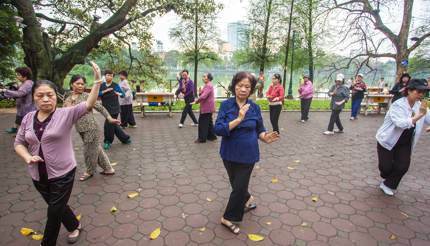 The tranquil heart of Hanoi, Hoan Kiem Lake, is a magnet for locals and is the place to join in a session of Tai Chi in the early morning. Without doubt, Vietnamese food is among the most delicious in all of Asia. Attend a cooking class and learn to cook flavourful Hanoi cuisine. For other offbeat attractions, including catching a performance at Hanoi Opera House, check out our Things to do in Hanoi guide. 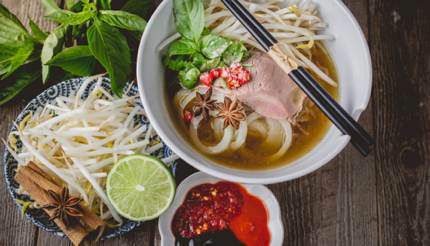 Pho – Vietnamese soup with rice noodles and meat (usually beef) and fresh herbs. The Hanoi version has a hint of cloves and the broth is also clearer. Bun cha – grilled pork strips served over a bowl of noodles. This speciality from Hanoi is simply delicious. Nuoc mam – ever-present accompanying sauce made of fish sauce with vinegar, lime, sugar, garlic and chili. Bia hoi – fresh beer produced locally. It isn’t particularly alcoholic but very refreshing. Tipping: a 5% to 10% tip is customary in the tourist areas as the food is cheap and the servers get low salaries. In Hanoi, apart from the delicious street food, you can get some excellent French cuisine. Check out the Restaurants in Hanoi guide for recommendations. 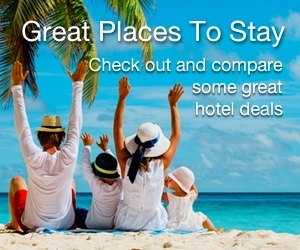 Hanoi has no shortage of hotels and it is easy to find one that suits your budget. The cream of the crop is Hilton Hanoi Opera. Nestled in a stunning colonial building next to the Opera House in the French Quarter, this hotel offers style and comfort and its open-air bar is a popular nightspot. For something moderately priced, the 3-star Hoa Binh, which is within walking distance of Hoan Kiem Lake, is a popular choice. For more recommendations, see our Hotels in Hanoi guide. Visiting the famous Beer Corner (Bia Hoi Corner) is a must for visitors to Hanoi. Located at the intersection between Tạ Hiện and Lương Ngọc Quyến streets, this is where you sit on a plastic stool among the locals, eating fantastic street food and washing it down with Bia Hoi, a cheap local draught beer. If you’d like to visit a dance club, The Bank Hanoi, doesn’t disappoint. Turn to our Nightlife in Hanoi guide for more recommendations. While in Hanoi, it’s almost an obligation to visit Halong Bay, the UNESCO World Heritage Site which is about four hours away. The bay has over 1,600 limestone islets rising up from the sea, many of them have spectacular caves. For other excursion ideas, check out the Hanoi tours and excursion page. 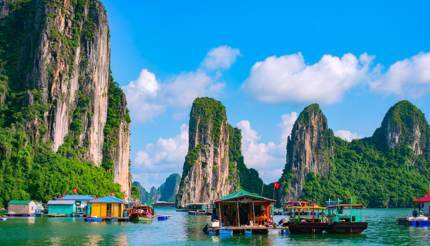 At present (2017), nationals of Denmark, Finland, Sweden, France, Germany, Italy and the UK can visit Vietnam for up to 15 days (inclusive of dates of entry and exit) without a visa. For visit of up to 30 days, please get an e-visa online before your travel. Before your trip to the great city of Hanoi, don’t forget to read through the comprehensive Hanoi city guide that can help you to plan and make the most out of the capital of Vietnam.